Go home (get booted out) on the 5th. 17th. I would rather not have the reading week and finish a week early. 5:15, Linear Algebra, 4th consecutive lecture on a Friday afternoon. I don't get why that is awesome. I thought it was sarcasm. But perhaps not? But what is so 'not awesome' to warrant sarcasm? 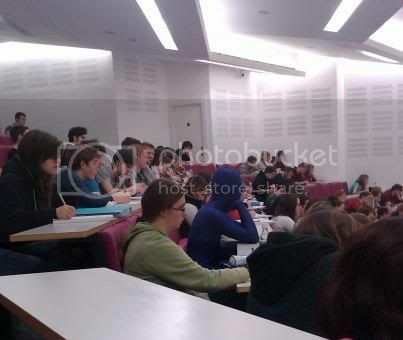 It's the fourth consecutive lecture (on a Friday afternoon) and there is a high turn out? Is that it? People are more likely to turn up to a lecture if it's straight after another one, in my experience. There's a... blue person... in the middle of the room. We have a lecture in a chapel. Its very surreal. P.S. Well, that could just be the fact that I'm normally tired as hell at time the lecture is on. There's a guy in a purple morph suit in the middle of the picture. He didn't speak the whole time, he just shrugged at everything and stroked his non-existent beard. I have been going to bed later and later, but with three 9am and one 10am starts a week, that is no good thing. Also, I was writing up a list of the lecture notes I need to copy up from missed lectures and it looks like I have mised more than half of my Numerical Methods lectures this term. Oops. Home for me is in Lancashire, around ten miles north of Manchester ^_^ . It's kind of weird, I still don't really regard Cambridge as 'home' like I do my home back up north... Hmm, it'll come sooner or later I suppose . Hah, I love wearing my tribal design and animal t-shirts - nothing like an excitable dress sense to get people to pay attention ! Gave up on stats coursework after an hour and 20mins. I might just settle for 0 marks as none of it makes any sense. The lecturer is stupid, he goes about proving every E[X] etc and never does any examples involving any distributions. Why do we care about the proofs that your not going to test us on. eurgh! I'll do it tomorrow I guess. Being drunk in lectures is fun. Looking at it now. Damn. Looks like I need to read stats notes. Although, most I can actually do from S2 if I really pushed myself. Which, I won't do. But, the exam is going to be worse so I'm not going to settle for a 0, because at this rate I'm going to get 30% on the exam. Wow, I need to revise for a test in that week too. Whilst I get that he's a good lecturer, the Johns' fetish of him is becoming quite pathetic.